This tank was left in Molasses mix for 2 weeks with part of it left in the free air, so you could see the difference, the paint, primer and all the rust is gone, that’s when we discovered the repairs to the tank! I get asked questions about bikes from all over the world, every week numerous emails arrive asking about how to do something or seeking my opinion on a bike or technique, one email was on using Molasses for rust removal. Eager to expand our knowledge, Heather and I went for a ride and got some Molasses from her brother (he has a few head of cattle on a farm) and mixed enough up to make up 50L to do some experiments with various metal object (z650 exhaust headers and old fasteners). One thing I discovered is Molasses tastes just like licorice 🙂 no wonder the cows love it! 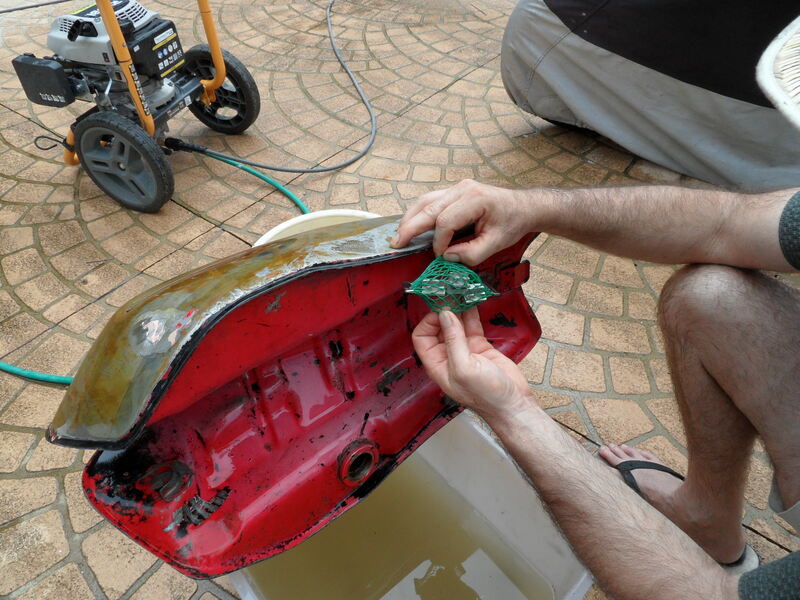 It also eats rust really well with no effect on the non-rusty metal parts! After one week the rust has been removed from most of the header pipe, it has also de-coked the inside of the pipes which would make it OK to send to a chrome works as there is nothing left to contaminate the chrome tank’s electrolyte mix. We plan to leave the parts in for 3 weeks, checking it every few days. The mix ratio is 10L of Hot water to 1L of Molasses and stir it so it does not initially settle. After that you just sit the items in the tank (in a plastic carry holder is fine) and the mix does its thing. The things you find! A piece of lead in a mesh bag inside the tank… not sure if it helped! 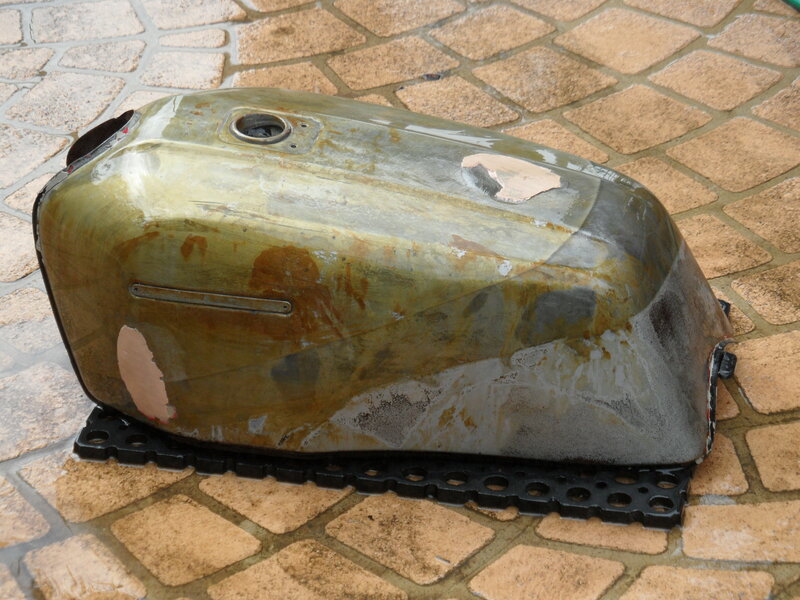 Bottom of tank shows original colour of the 1981 GPz1100B1 (Firecracker Red). The exhaust pipe will need a going over with the Gurney (water blaster) when we are ready to remove it and repaint the heads, as for the rusty bolts, most were shiny after a week, I will put them back on the 650 and see how long they last before they start to oxidize again. So at this stage, Molasses looks like a brilliant method of pre-cleaning steel. I have taken some before and after shots to show the difference. So not just satisfied with a tank and exhaust headers, we decided to try some nuts and bolts in various states of rusting.